When I was approached by RxArt on posting a review for them and after reading about what they do, I personally had no choice. I think what they do is truly amazing. I don’t like hospitals myself but when you walk into a hospital with beautiful and creative art, it tends to lift your spirits. This is what RxArt does. They work on all sorts of projects bringing art to hospitals that all patients of all ages can enjoy to raise their spirits. There are patients in hospitals that have to deal with a lot of different ailments that make them worry enough. RxArt brings relief to patients and work hard to make it easier for them to make their surroundings a more cheerful place. Working with a lot of contemporary artists Jeff Koons, William Wegman, Sol LeWitt, Frank Stella, David Row, David Humphrey, many, many more. They have done projects in hospitals such as Beth Israel Medical Center, The New York Center for Children, Children’s Hospital Boston, NYC Child Study Center, and quite a bit more. Below are a few images of some of their artwork projects that are also found on RxArt website. Their projects aren’t all wall art either. One of their latest projects was a CT Scan designed by Jeff Koons that was unveiled in Chicago’s Advocate Children’s Hospital and are in the process of fundraising for more installations throughout New York City. The CT Scan was featured in New York Times Magazine and you can see it here. When I saw it, I was truly amazed! How does RxArt fund-raise for their projects? They have coloring books and puzzles that anyone can purchase and the proceeds from all sales benefit RxArt future art projects. We were actually sent both of their coloring books that they also hand out to kids in their partner healthcare facilities. Their coloring books are titled Between the Lines Volume 1 and Volume 2. These wonderful coloring books are filled with drawings from the many artists that RxArt works with. These coloring pictures are just beautiful. Some look like drawings while others even look like abstract art. Some pictures are flowers or animals and others are scenery, people or abstract art as I mentioned above. 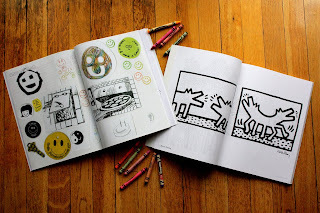 These books aren’t your typical coloring book but filled with art that can be colored in. In the middle of the books are colorful pages that actually have stickers in them. These sticker pages are also beautiful works of art too! All the art pictures found in the books tell you what artist the pictures are drawn by. A lot of the pictures even has the artist’s signature printed on them. 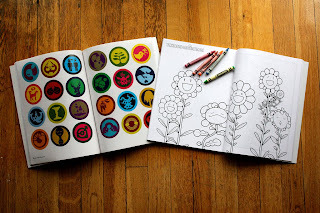 My kids loved these books and they have already colored them up. I think any coloring book is great for kids but I love that these are filled with art. I think art is very important. The pages in these books are more stimulating, fun, relaxing and definitely would bring relief to any child. Your kids will always find something very different and unique on every page in these books. As I have already mentioned, I think what RxArt does is amazing. I also think Between The Lines coloring books are amazing and love that they are a non-profit organization. These books are a wonderful way for RxArt to continue their fundraising efforts to keep doing what they do. 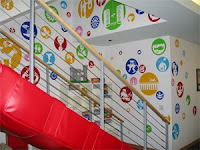 To read more about RxArt and what they do, please visit their website. You can also read more about their projects by visiting RxArt Blog. Buy It: You can buy Between The Lines Volume 1 and Volume 2 by visiting RxArt. They also have puzzles that you can purchase as well. Remember, all proceeds from sales help benefit future RxArt projects! Win It! 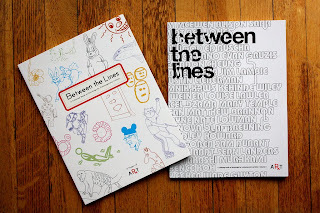 RxArt is generously offering my readers a chance to win both volumes of Between The Lines for themselves. One of my lucky readers will win both of these wonderful art filled coloring books! *Tweet about my giveaway and leave a URL of your tweet in a comment so that I can verify your tweet (1 entry and can be done once daily) Leave a comment with URL each time you tweet. Giveaway is open to US. Giveaway will end July 14 @ 11:59 PM (EST). Winner will be chosen using random.org. Winner will have 48 hours to respond after I contact via email. If winner does not respond, a new winner will be chosen. Good Luck!